Okay. I know, this is a record. But tonight I made cookies on a sandwich maker for the first time in my life because we don’t have an oven or a stove (the people I am staying with have been renovating their house). Lawrence requested oatmeal cookies. I was inspired by the Ultimate Vegan Oatmeal Raisin cookie recipe from Oh She Glows, which is an amazing blog, if you haven’t checked it out yet. 2. 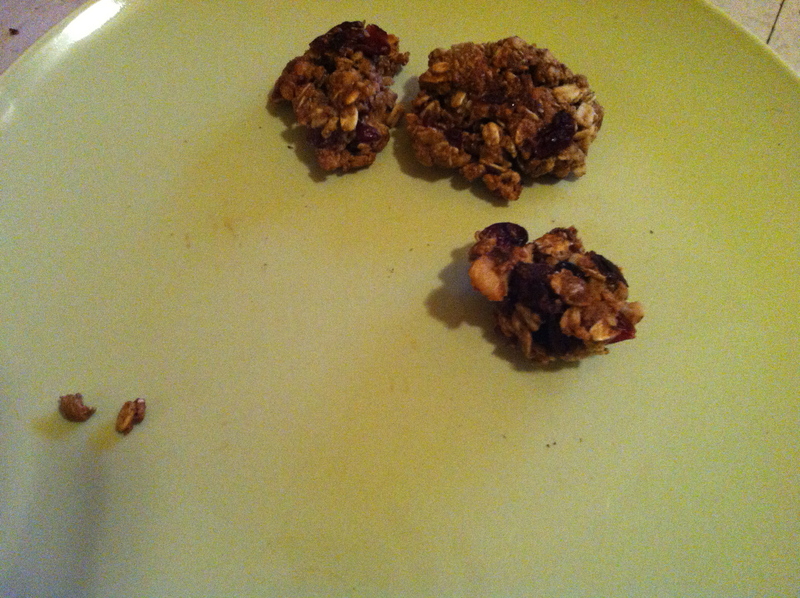 Soak 1/2 C dried cranberries in hot water until you are done preparing the cookies. 3. Grind 1 1/2 tbsp flaxseed. Add 3 tbsp hot water. Let stand for 5 minutes. 4. Melt 2 tbsp coconut oil in a small pot until liquid. 6. Drain the dried cranberries and mix into your cookie dough. 7. Use clean hands and take small 1-2″ balls of dough and flatten with your hand. Place on hot sandwich maker. The one here has a setting that closes the lid, but doesn’t touch or flatten what’s inside. I closed it like this to create a bit more of an oven environment (if that is even possible!?!). You will still need to flip the cookies – about 5-7 minutes on one side, then 4-5 minutes on the second side. Makes about 15 small cookies. So delicious! I told Lawrence if he puts in the stove tomorrow, I will try making another batch in the oven. He told me I should make a triple batch! 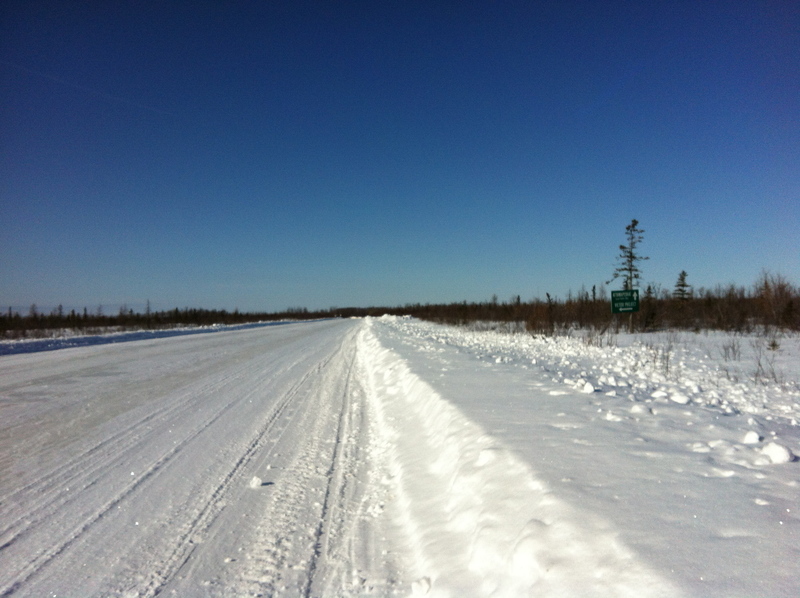 The ice road heading North into Attawapiskat – can you spot the sign on the right? The road off to the left heads to the DeBeers Diamond Mine. Today I realized that my limit of cold weather running is not -20°C as I had previously thought. Since I have been in Moose Factory and Attawapiskat in Northern Ontario, I have been on a few runs, but not many. I only go out running when it seems unusually warm. However, my friend Emily who is in midwifery with me, put out the offer for anyone who wanted to join her in the Mississauga Half Marathon on May 5. I thought, why not? After all, I am starting my year of being on call the following day. And we all know that it is pretty hard to run 21 kilometres when you are on call. So I think I will. Although I haven’t registered yet, I did go out and run for one hour and forty five minutes today, which is at least 30 minutes longer than anything I have run in the past year….and definitely the coldest long run I have ever done – 24°C, “felt like” – 32°C with the wind. It is isn’t so bad running in the cold! …Except the brain freeze part. I thought it was only for the first couple of minutes (despite the three layers on my head), until I passed the town of Attawapiskat and was on the open road. Even if the wind is minimal, it really stings when you are trying to run into it. I had to stop and hold my head with my mitted hands a few times, or alternate between sideways running or running backwards – just for a few steps until I warmed up and could face the wind again. Next time, I will wear either a thicker touque (I wore a lined balaclava, wool ear band and tube neck warmer over my head) or a hood which could cut the wind a lot. The other challenge of running up here is wearing sunglasses. 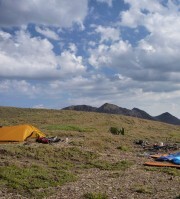 As you can tell from my photo, it is almost always sunny up here. So sunny that with the snow, it is really difficult to see if you don’t wear sunglasses. However when I covered my nose and mouth, my glasses fogged up very quickly! I decided that squinting on the return into the wind was better than keeping my nose uncovered. 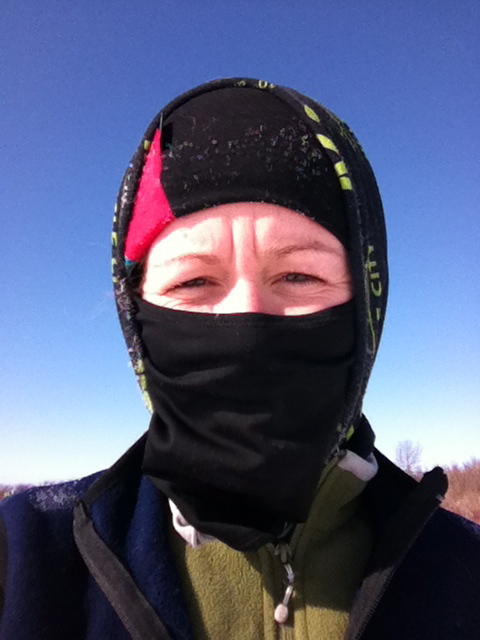 I am glad I have figured out how to run with my face mostly covered – which is – slow. Really slow. I believe my LSD run pace during marathon training was 6 min/km. I wouldn’t be surprised if I was running a 7 min/km today. It was mostly out of necessity though to keep myself from falling on the ice road. Overall, it felt good. Want something sweet and salty and entirely satisfying? Do you want to love olives but don’t? Try this super easy recipe. 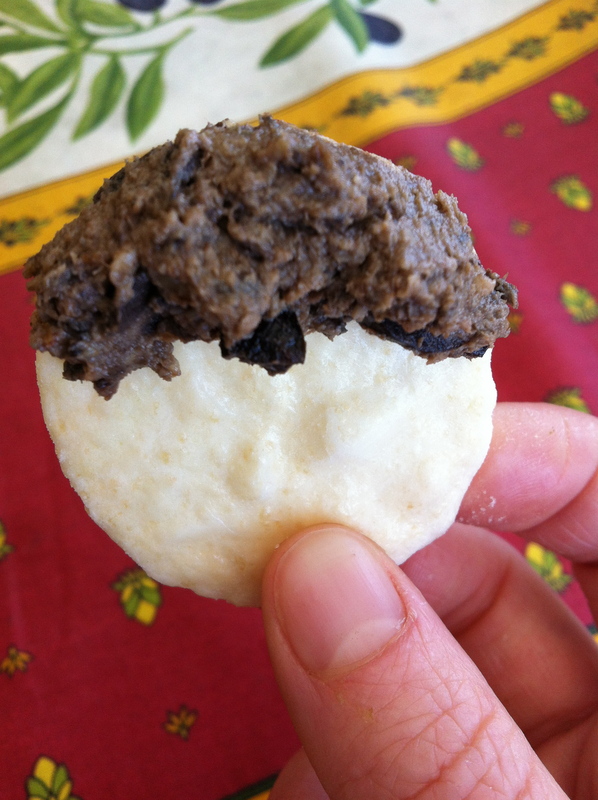 This recipe is really easy to adjust if you want it sweeter or less sweet, if you love balsamic vinegar etc. Serve with your favourite cracker, or try it as a spread in a sandwich! So delicious, you might want to double it. My roommate in Moose Factory and I, ate this all in about 10 minutes and then made another batch.